Getting older is something most of us don’t want to acknowledge. There’s a lot to think about so not thinking can be easier. As our loved ones age, avoidance is no longer a possibility. Fortunately, Synergy HomeCare is there to help. 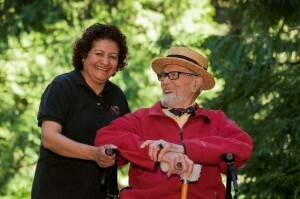 Synergy specializes in helping seniors and families manage the aging process. Part of Synergy’s approach is the C.A.R.E. model which stands for Coordinated and Responsive Engagement. “We work closely with our caregivers to ensure there’s a lot of communication between the family, our caregivers and our office,” says Brad Rossman, General Manager of the Olympia branch of Synergy HomeCare. “Not only do we manage our own excellent caregivers, but help coordinate visits from home health RN’s, needed for medical attention, and visits to the doctor.” This all creates a solid continuum of care for loved ones. An integral part of C.A.R.E. is making sure the client is getting his or her needs met. Initial visits with caregivers are always monitored and follow-ups happen on a regular basis. “Right after a caregiver is assigned to a case we reach out to the client to make sure everything worked out okay,” says Rossman. If the caregiver isn’t a good fit then Rossman works to find a better match. Access is a big concern for anyone with aging friends or family. The staff at Synergy is available anytime. Says Rossman, “we try to get back to them [clients] within two hours of the initial phone call.” This added piece of mind helps build trust between all parties involved. Aging is more than just wrinkles. There’s a lot to consider. The staff at Synergy HomeCare offer a variety of services to help make those decisions. To find out more, click here or call 360-338-0837.